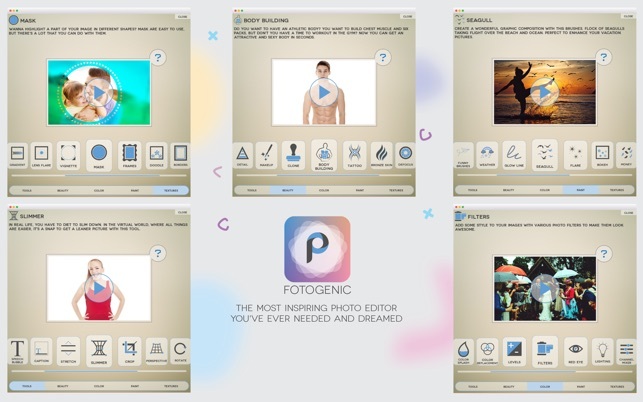 "Fotogenic" is the best choices for photo editing app to suit every level of photographer. We've created an interactive help for you to understand how to use it for each feature. Even if you have never used photo editing app before, you will create wonderful works of art. It has an innovative and easy to use interface that creates a beautifully simple user experience. 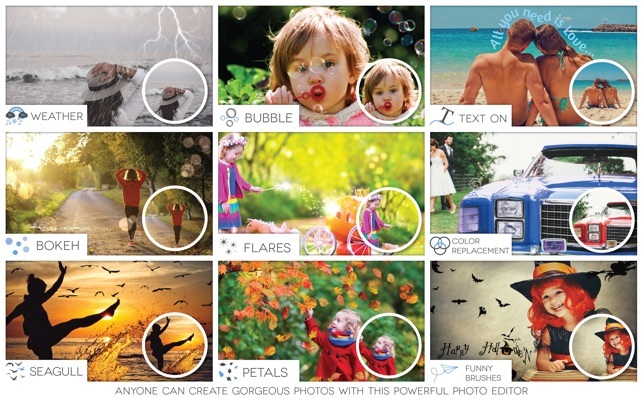 It's easy and intuitive for beginners yet capable enough to be appreciated by professional photographers. • Money : Take them, they are flying into your hands! • Mixer : One of the fastest ways to get amazing looking images is by using Blending modes. • Grunge : Convert normal everyday photos into worn out style. • Gradient : Create natural looking composite images. Drag and drop image for open as tattoo, blend etc. Some of the features look to be worthwhile, but they are locked and unusuable in the free version. Nevermind that, however, as what will drive you crazy is the user experience. First issue: this app was designed strictly for phones and it is a direct port from there. Apple never should have allowed this in the Mac App Store, because it is not a Mac app. There is nothing about the user experience that is remotely Mac-like and it doesn’t even fit a desktop monitor properly. The person who pushed the button to release this should be retrained. There is no menu up on the menu bar, except for Quit. There is no open, and no save. Second: everything is designed to be bouncy. As the app moves between views, everything bounces in and out. On my big screen, that means multiple graphics going bonkers bouncy everywhere. 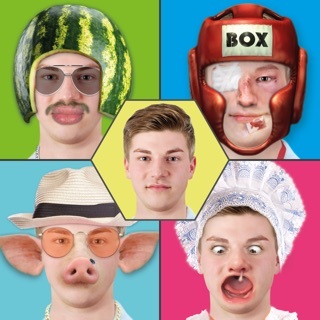 It’s a headache and very unprofessional —even for an app intended to be a laugh. Third: many of the edits don’t seem to do anything. I used the Smooth tool on a butterfly pic and nothing happened. At all. It was totally indistinguishable from the original. Don’t spend $3 here until they make this into a proper app. First - Your feedback is not sincere at all. The smooth tool is not designed for butterflies. We showed in the tutorial how to use it and we explained. I think it's the best smooth tool that can retouch without losing your facial lines. Second - if you want to open image you can do it from the menu button in the lower left corner or drag and drop or using "open with Fotogenic". Third - this is not a mobile program port. It was originally designed for desktop PCs and ported to iOS and android. So we work hard so much to ensure the same user experience. Some have commented that this looks like it was designed for iOS. I agree that it certainly is not designed for a desktop user with a mouse. The effort to add one word to a photo is too much to make me want to try this again. Looks like an app headed for the Trash. It’s not the prettiest or easiest User Interface - but after trying out about 5 photo editors (I am useless at photoshop and adobe) this was by far the best - and cheapest one. If there were an erase feature that eraed section (as opposed to eraing an action you just took) I would have given it 5 stars. 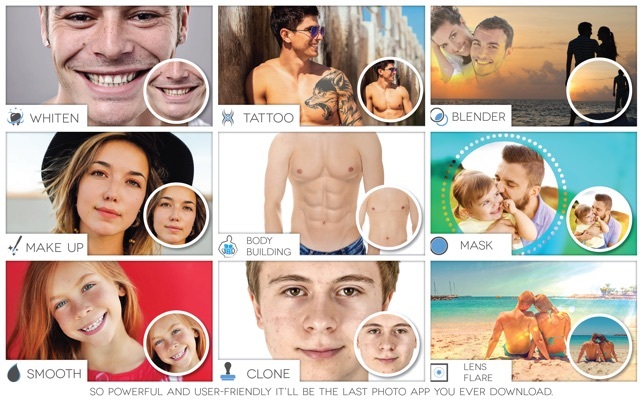 If you are looking for a Mac version of FaceTune - this is it!